Meenkunnu Beach is located at the North Kerala village of Azhikode, 12 kilometers away from Kannur town. Tourists reach here after spending time at the main beach at Payymbalam are happy to discover their preferred choice of escape - a beautiful beach of golden sands tucked behind the thick line up of tall palms. The place has a slow pace. It is an area of fishing hamlets. 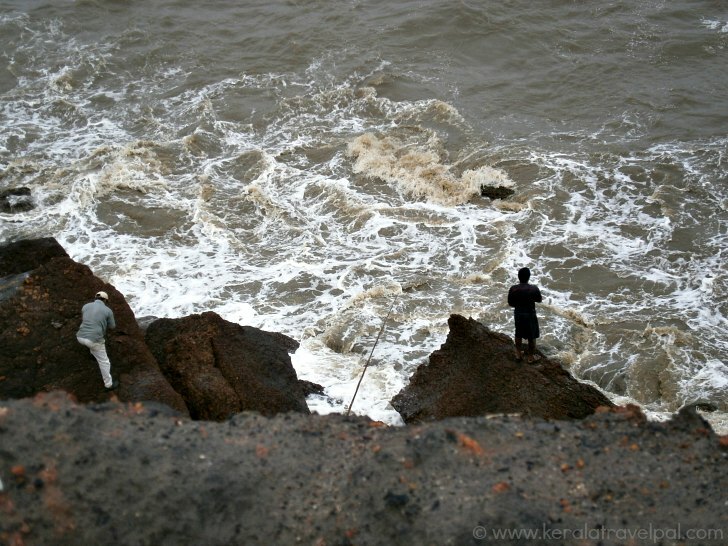 It is interesting to watch people doing different types of fishing and catching fish right at the beach. This beach is indeed a refreshing choice for those who find Payyambalam beach a bit touristy and crowded. 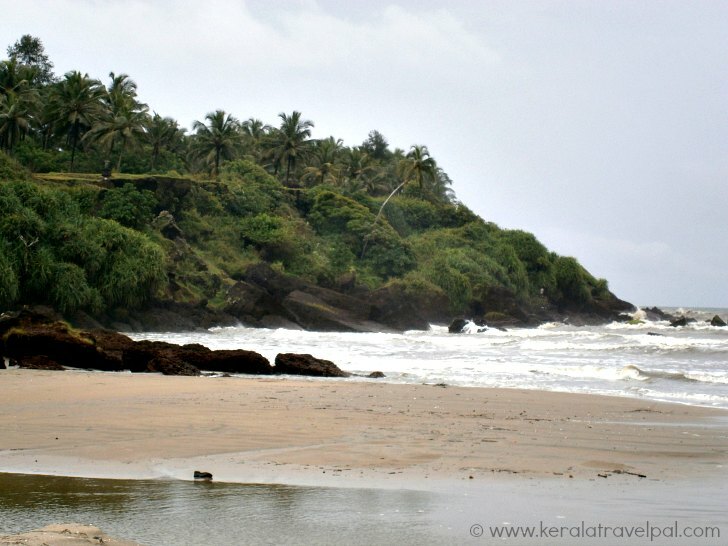 Meenkunnu beach is 10 kilometers north of Payyambalm along the same stretch of shoreline. Meenkunnu means hill of fish, in local vernacular, indicating the strong fishing tradition of beach side villages. Other than fishing folk, you may find very few people on the beach. That makes here the perfect spot to forget the worries of the world. The cliff on top of this beach is a good view point. However, if you happen to arrive there in a vehicle, there is a better entry point to the beach. To get there, return and take the road to the north. At this remote place, a new world is ready for a gentle takeover of your universe - a world of coconuts where the order of the sands is shells, fish, tiny crabs, pebbles and bubbles. Chala beach is just a short stroll away from Meenkunnu beach. Appearing as a northern extension of Mennkunnu itself, Chala beach is narrower although cleaner. It is also more visitor oriented with a beach garden and well laid out beach entrance. This beach strip is remote and private, yet there is nothing much that could be done in this paradise of plain idling. Spending part of a day here could fit in well as Kannur coast has more to offer along the strip of Kadalai – Thottada and Kizhunna – Ezhara, all pristine beaches in convenient traveling distances from Kannur town. You may also want to load up some of the local fun and excitement, especially at Parassinikkadavu temple and backwaters. It is also a good idea to carry some drinks and snacks with you as you may not find them anywhere near the beach. Those who really feel inclined to chilling out a bit here may have to consider staying at Kannur. Modern tourism is yet to reach the remote village of Meenkunu. So there is a definite lack of beach front tourist accommodations. Also to bear in mind that Meenkunnu beach strip is more of a fisherman's area. That can be a restrictive factor, especially for women. For these reasons, Meenkunnu- Chala beach strip is ideal for short visits. Budget to luxury accommodation choices are available at Kannur town. There are several hotels, lodges, resorts and home stays. Kannur town is just 12 kilometres away. From Kannur, Meenkunnu can be accessed by taxi or auto-rickshaw in well less than an hour. Make sure to organize some vehicle for your return trip in advance. Accommodation Options : No accommodations near the beach. Hotels, lodges and homestays at Kannur. Nearby Attractions : Thalasseri fort, Arakkal Museum, Kizhunna-Ezhara Beach, Mappila bay, Payyambalam beach, Kannur town( shpopping & food), Dharmadam Island, Kannur fort, Andalur Kaavu, Parassinikkadavu, Muzhappilangad drive-in-beach and Sea View Park.